The milestones continued in the 1970s. The Navy’s women in ships program began in 1978. It allowed women to serve on a wide variety of auxiliary ships (but not combat ships). 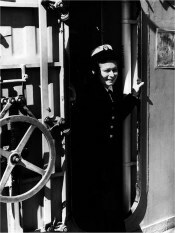 This photograph shows Seaman Recruit Joy Turner in the doorway of a repair ship. In 1978, USS Vulcan became the first U.S. Navy ship other than a hospital ship to have women permanently stationed on board. The photograph comes from the Naval History and Heritage Command.